An inventory organization can be a logical entity like an item master organization which only holds items with no transactions, as we saw in the last section. In the real world an inventory organization represents a physical entity like a manufacturing facility, warehouse, distribution center or a branch office where inventory is stored and transacted. It has its own location (optional) with a primary ledger (set of books in 11i), a costing method, a workday calendar, and a list of items. In short, this organization is used for inventory management. Inventory Organizations are made up of one or more subinventories which can be made up of one or more locators. Office Smart Solution (OSS) has two manufacturing facilities located at Naperville, Illinois and Evansville, Indiana. The consultants at OSS will have to create these two in Oracle Inventory. Here, we sit down with the consultants and watch them set up the facility at Naperville. The organization’s name should be indicative of its location. Though not mandatory, it is a good practice to follow. The Location Address identifies the physical location of the organization. 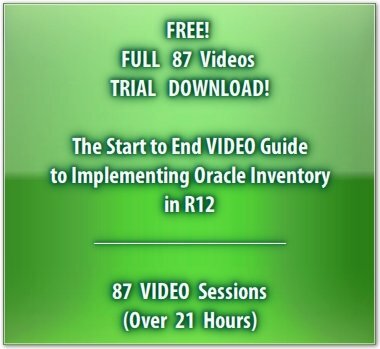 Locations are shared between Oracle Inventory, Purchasing and Human Resource Management. Each organization can be linked to only one location. The location for the Naperville facility of OSS was created as below. If the location is flagged as Global, then it is available to all Business Groups. The location name generally bears some resemblance to the organization name. Here, the consultants decided to keep the names identical. Based on the Address Style you choose from the available list of values, when you click on the Address field a pop-up window opens. Here you can enter the complete address. Returning to our Organization setup, we need to classify the organization as an Inventory Organization. We need to save our work before proceeding any further. Once we enter the realm of organization parameters, we will have to complete all the fields before we can commit our work. This means we need to assign the Naperville facility to the Primary Ledger, Legal Entity and the Operating Unit created earlier for OSS. The consultants assign a unique short code to the organization – OSN. Now, they must specify the item master organization. 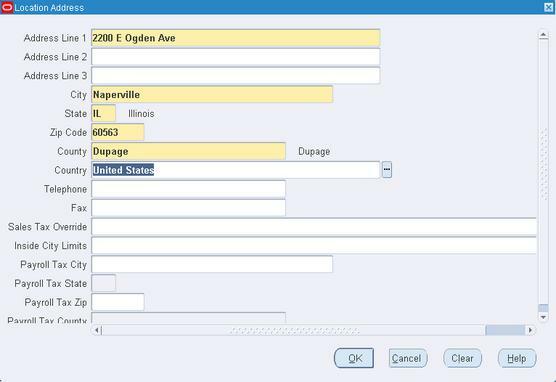 Oracle defaults the field to Office Smart Naperville. 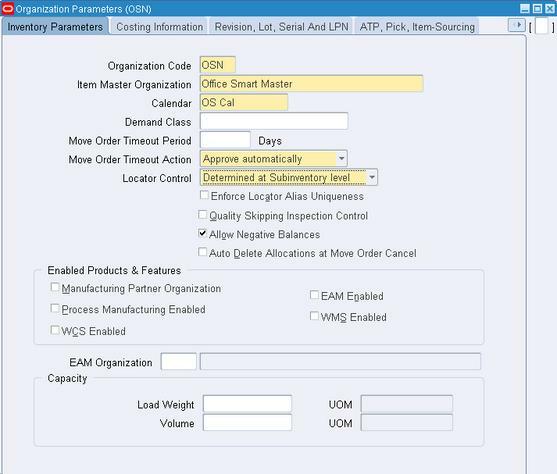 The consultants must manually change this by selecting the item master organization Office Smart Master from the list of values. The manufacturing calendar OS Cal defined earlier has been attached to OSN. The Move Order Timeout Period and the Move Order Timeout Action work in conjunction. Both these parameters have to do with the approval process for Move Orders, as we shall demonstrate in the section on Move Orders. If you want your move orders to go through an approval process, enter a value in the Move Order Timeout Period field, else leave it blank. Accept the default value of Approve automatically in the Move Order Timeout Action field. The Locator Control field specifies whether you want locator control for this organization, what kind of control you desire and if that control is to be established at the subinventory level. In R12, you can create locator aliases for stock locators within a subinventory. Here, in Enforce Locator Alias Uniqueness you determine if you want your locator aliases to be unique across this organization. 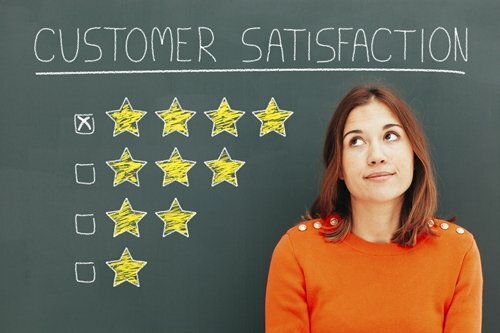 Quality Skipping Inspection Control needs to be enabled if the organization intends to use the Skip Lot feature available in Oracle Quality. If the organization allows on-hand inventory balance to go negative then the Allow Negative Balances box should be checked. However, Oracle Work in Process (WIP) ignores this setting in a particular situation. If there is insufficient on-hand quantity of WIP components in the supply subinventory to meet the backflush demand, then WIP forces the supply subinventory balance negative even if the organization does not allow negative balance…provided…the profile option INV:Override Neg for Backflush is set to Yes at the Site level. Detailed explanation of the other fields is available in the R12 Inventory User Guide hence we shall skip that here. The Costing Information is a vital component of the organization definition. 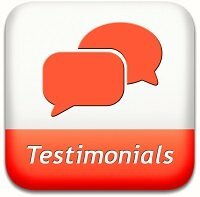 OSS consultants know that they need to select the costing method at the organizational level. The Naperville facility uses Standard Costing. 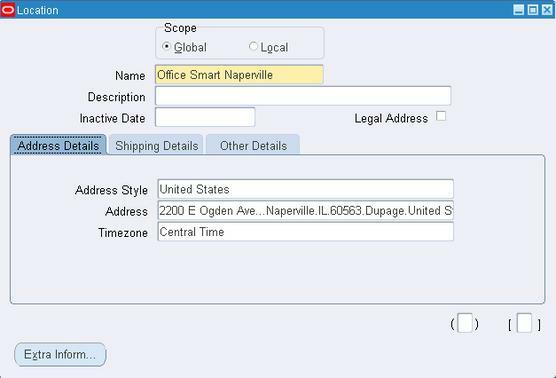 Since item costs are not shared with other facilities, Office Smart Naperville will be its own Costing Organization. A Note on the Costing Organization: The Costing Organization displayed in the Costing Information tab of Organization Parameters is based on the control level that you set for the item attributes Costing Enabled and Inventory Asset Value. If the control level for these attributes is set to Master, then the item master organization defaults as the costing organization. The current organization is displayed if the control is set to Organization level. In this case, all organizations maintain their own item costs, as has been decided in the case of Office Smart Solutions. However, organizations following the Average Cost Method, always maintain item costs at the organization level. The Valuation Accounts and Expense Account are used as defaults when subinventories are being set up for the organization. The Material Account is required for all organizations. Material costs represent the cost of raw material component at the lowest level of the assembly. 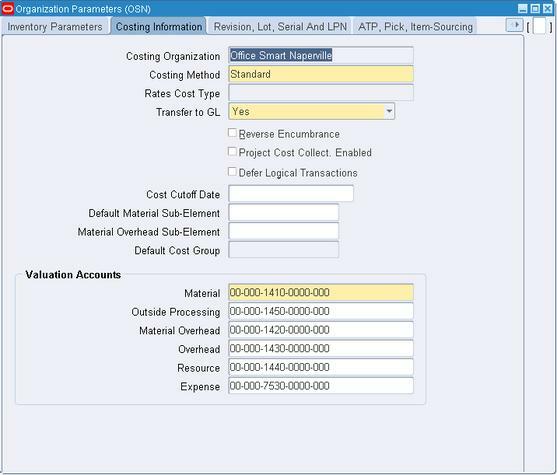 For asset items, the material account is used as the default requisition account when you create purchase requisitions from MRP, min-max, or organization-level reorder point planning. When you receive the purchase order, however, you use the appropriate valuation or expense account. The Outside Processing Account tracks Outside Processing (OSP) costs. OSP costs represent work performed by a supplier on a discrete job or repetitive schedule. The Material Overhead Account tracks material overhead or burden costs. These are the costs required to bring items into or out of inventory locations. The Overhead Account tracks costs related to resource or department overhead. The Resource Account captures resource costs which are direct service costs required to manufacture products. The Expense Account is used to record the value of items issued to a non-tracked and/or expense subinventory.